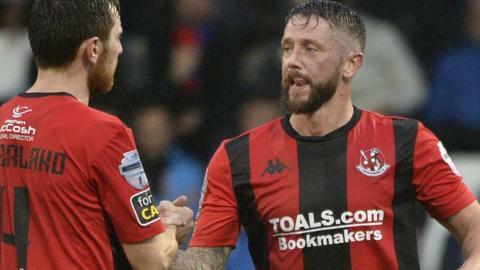 Crusaders went out of the Scottish Challenge Cup despite a second-half revival against Queen of the South. A Rory Patterson brace and a late Paul Heatley strike were not enough for the Crues as they lost 4-3 in the second-round tie at Palmerston Park. Coleraine, the Irish Premiership's other representatives in the competition, beat Formartine United at home on penalties to go through. The Bannsiders won 2-1 on spot-kicks after the match finished 1-1. Recently-departed manager Oran Kearney was at the Coleraine Showgrounds to say a final farewell to the club before taking charge at Scottish Premiership side St Mirren. In a somewhat bizarre penalty shoot-out, both teams missed their first three penalties before Eoin Bradley, who had a spot-kick saved in the first half of normal time, put Coleraine 2-1 up with their fifth penalty. Conor Gethins then put his wide for the visitors to send the Bannsiders into round three. Archie McPhee had opened the scoring for Formartine in the 20th minute, but his effort was cancelled out 11 minutes later by a beautiful volley from the edge of the box from Josh Carson. At Palmerston Park, meanwhile, two goals from Stephen Dobbie and efforts from Lyndon Dykes and Gary Harkins had given the home side a 4-0 lead at the break before the Crues hit three in the second-half. Dobbie opened the scoring for the Scottish Championship side in the 23rd minute and Dykes doubled the lead two minutes later. Harkins made it 3-0 on the half hour, with Dobbie adding to the Irish Premiership champions' misery in the next minute. The Crusaders fight back was led by summer signing Patterson when he finished off a good move to grab a goal back three minutes after the break. The former Derry City striker got his second on 50 minutes, finishing from the penalty spot after a handball in the area. Heatley made it a nervous end to the game for the hosts when he ran through on goal in the 85th minute to score with a chip over goalkeeper Alan Martin. Heatley and BJ Burns had further efforts for the Crues but Queen of the South held on to make it through to the third round.